With a gene pool that bounces from Italy to Iceland via Weston Super-Mare it’s hardly surprising that Lorien find it hard to pin down their collective influences. The three piece from all over the shop channel a wealth of different experiences to forge some of the most inventive, elegant and fragile music you will hear. London, February ’98. Italian born vocalist/guitarist Fabio was busy minding his own business writing songs and pulling pints when a friend introduced him to Einar – a tall good looking bloke from Iceland. Einar could play a few instruments and was studying for a sound engineering course in Camden. The two set up a meeting, agreed to form a band and nodded heads in unison as their limited English ran dry. Meanwhile drummer Carlo – a former ‘Golden Sunbeds’ delivery boy had grown bored of servicing housewives and entered a full time course at London’s College Of Music. Einar had noted Carlo’s details in his diary only to lose it on the way home. As luck would have it, Parlophone’s Head Of A&R came across the diary and mistakenly sent it on to Carlo. To cut a long story short, it all came full circle and Carlo just had to join the band, it was like kismet. Or something. Lorien recorded their first material as part of Einar’s course qualification. The sessions spawned a demo that garnered an unprecedented initial response. Meetings at BMG, Warners, Parlophone and Virgin came and went and whilst the suits waxed lyrical, the band failed to agree terms. Enter Stevo – the infamous manager of Soft Cell and Cabaret Voltaire. Following a tip off, Stevo proceeded to hassle the band for six months until eventually the band could stand it no longer. Three months later, with a manager in tow and the band on the verge of playing their first ever gig, 3 record companies tabled offers. 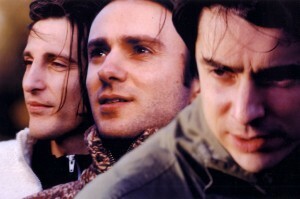 Lorien subsequently signed to Instant Karma/Dharma Records early in 2000 and proceeded to hone their sound playing live at venues throughout the country. Lorien entered the studio with the producer Mike Hedges at the helm in February of 2001. The first fruits of these recordings could be heard on the ‘Shivering Sun’ EP released in October to universal acclaim. ‘Shivering Sun’ garnered a series of glowing reviews including unreserved praise from the NME and London’s Evening Standard who called the single ’an unplugged lullaby of shimmering, delicate delight’. Lorien accrued further acclaim in January with their second release – the haunting ‘Ghostlost’. NME went on to cite Lorien as one of ’34 bands you must hear in 2002’. Musically faint echoes of ‘Bends’ era Radiohead, Coldplay and Talk Talk’s ‘Spirit Of Eden’ are apparent in the sheer intimacy and immediacy of the band’s songwriting. Expect gentle intros swelling to grandiose soundscapes, walls of feedback, inventive orchestration and chiming lullabies that get warmer with every listen. Lyrically, loose themes of optimism and bittersweet melancholia come to the fore yet Fabio is reluctant to be drawn on specifics, ‘You can read Alice In Wonderland at five years old but 20 years later, it’s a completely different book’ he says, ‘people should draw their own interpretations’. As for the name, it was culled from Tolkien’s ‘Lothlorien’ where Lorien stands as a mythical forest. Fabio liked the sound of it and somehow, it seemed kind of apt. Einar eventually re-invented himself as electronic genius Eberg.